Not too long ago, on a particularly glorious Sunday afternoon — the kind of sunny but cool day that happens all too rarely in Hong Kong — I took the MTR out to Po Lam station in Tseung Kwan O. 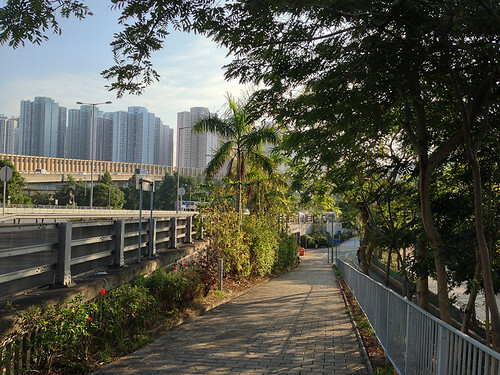 Leaving the station, I walked along a linear park built atop the MTR tracks, which led me to another path that meandered under a series of elevated highways and then down to the waterfront near Tseung Kwan O station, a couple of stops away from Po Lam. Lots of people were out enjoying the afternoon. I passed by plenty of cyclists — kids with training wheels, lycra types on road bikes, middle-aged women on rusty beaters with groceries in the front basket. 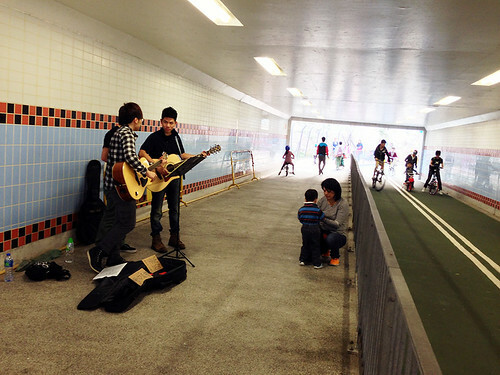 There were skateboarders, teenagers playing guitars, an old man playing the erhu, joggers, people pushing strollers, an old woman selling potato chips and Yakult on the side of the path. There was even a makeshift mosque set up beneath a highway flyover where Indonesian maids sat listening to a sermon broadcast over a crackly radio. It was the kind of diverse urban activity you find on a truly dynamic street. But none of this was taking place on a street, or even in a real park. The paths where all this activity took place are entirely removed from the surrounding commercial and residential areas. Most of them are lined by rows of trees and shrubs, beyond which are fences, walls or embankments. The paths are not unpleasant, thanks to the greenery, but the heavy pedestrian traffic on that Sunday afternoon existed in a kind of void: a lot of people passing through nowhere to go nowhere in particular. Tseung Kwan O is the newest of Hong Kong’s New Towns, a collection of master-planned satellite communities built over the past 60 years. The first New Towns were Kwun Tong and Tsuen Wan, industrial suburbs whose construction began in the 1950s. They were followed in the 1970s by a second generation of suburbs, including Sha Tin amd Tuen Mun. The most recent batch includes Tseung Kwan O, Ma On Shan and Tsing Yi, all of which started construction in the 1990s. Each generation of New Town has its own characteristics. The oldest were essentially industrial suburbs meant to house a fast-growing population of Chinese immigrants near the factories that employed then. 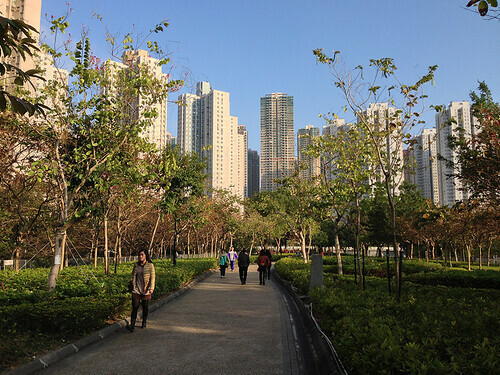 In form, they weren’t much different from old parts of Kowloon, with low-rise tenement housing along narrow streets, the one exception being the deliberate provision of more public squares, parks and open spaces. 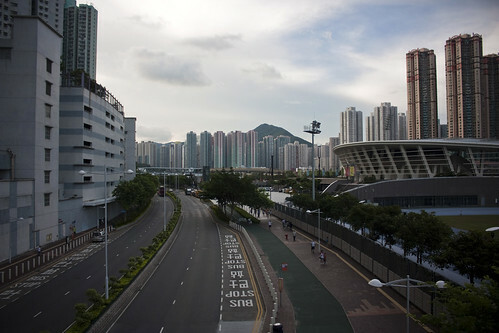 By the 1970s, the modernist bug had bitten Hong Kong’s urban planners, and Sha Tin — the largest of the New Towns — was built as a series of superblock housing estates linked by footbridges, at the centre of which is a civic centre consisting of a park, a library, a theatre and a big shopping mall. Basically, it’s Le Corbusier’s Ville Radieuse transplanted to the subtropical hills of Hong Kong. Tsueng Kwan O was master-planned in 1982 and built on land reclaimed from Junk Bay in the early 1990s. Nearly 400,000 people now call it home and it has become Hong Kong’s fastest-growing district. Its design follows many of the same principles as that of Sha Tin, with the notable exception that its development is focused around four MTR stations. On paper, it ticks all the checklists of good transit-oriented development: nearly all residents live within a 15-minute walk of rapid transit; high-density housing is located in close proximity to retail shops, markets, schools and public facilities; bike paths thread through the district. 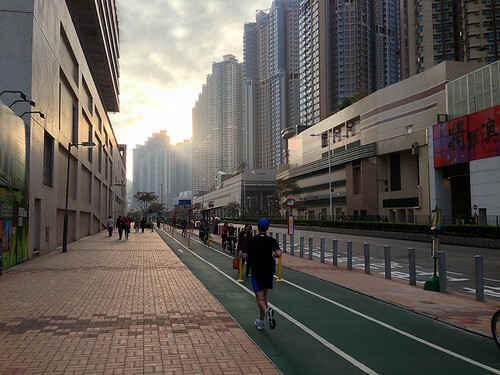 Unfortunately, Tseung Kwan O is no more than the sum of its parts. It is planned but not designed. What that means is that all the essentials of a good urban environment are provided for, but they are usually poorly implemented and thoughtlessly executed. 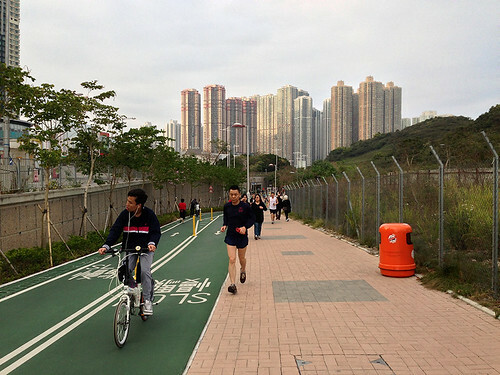 One example is the cycling network, which is incomplete and haphazardly arranged, making it frustrating to use for people who want to use their bikes to ride to the MTR, the wet market, school or the shopping mall. Another shortcoming is the lack of quality public spaces. 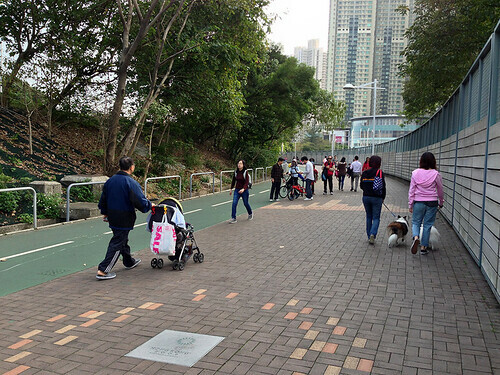 One of the busiest spots I visited on that Sunday afternoon was the Junk Bay waterfront near Tseung Kwan O MTR station. This ought to be a focal point for the whole district, but it’s really just an afterthought, a leftover bit of concrete near the water with nothing around it. Yet, despite the lack of provisions, people flock here to stare out at the water; it’s a particularly popular gathering spot for dog owners. What Tseung Kwan O lacks are streets. It does have roadways, of course, but they are wide and impersonal, meant to carry vehicles and pedestrians between superblocks; walk along one of these arteries and you’ll find yourself greeted by blank walls, air conditioning vents and loading docks. Inside each block is a self-contained world: over here a shopping mall, over there a housing complex with its own swimming pools, tennis courts and clubhouse. A great street wears many hats — it’s a place to shop, to eat and drink, to bump into friends and neighbours, to linger and enjoy the nice weather on a sunny afternoon. 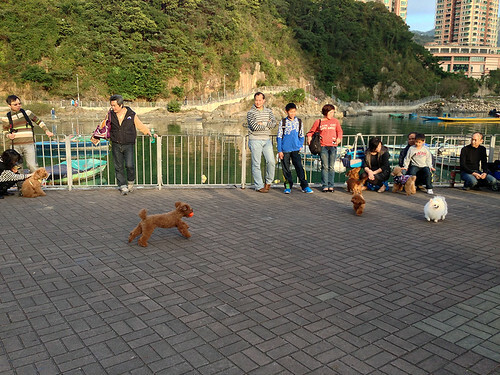 There’s nowhere like that in Tseung Kwan O. Rising straight up from it are walls of houses, which when seen against the sky-line present a grotesquely jagged silhouette of gables, attics, and zinc chimneys. At the very bottom of this scenic railway lies the street, plunged in eternal twilight. The sky is a remote hope far, far above it. The street is no more than a trench, a deep cleft, a narrow passage. And although we have been accustomed to it for more than a thousand years, our hearts are always oppressed by the constriction of its enclosing walls. The street is full of people: one must take care where one goes. For several years now it has been full of rapidly moving vehicles as well: death threatens us at every step between the twin kerb-stones. But we have been trained to face the peril of being crushed between them. Nothing of all this exalts us with the joy that architecture provokes. There is neither the pride which results from order, nor the spirit of initiative which is engendered by wide spaces … only pitying compassion born of the shock of encountering the faces of our fellows; and the realization of what the English call the “hard labour” of our own lives. The street of today can sustain its human drama. Then why does it still exist? In the years after World War II, Le Corbusier’s radical thinking inspired American public housing projects and Oscar Niemayer’s plan for Brasilia. And years later, filtered through the peculiar prisms of Hong Kong land policy and late-stage capitalism, it produced Tseung Kwan O, a city whose inhabitants roam concrete pathways on a sunny afternoon in search of a street. This entry was written by Christopher DeWolf , posted on Wednesday February 27 2013at 10:02 am , filed under Art and Design, Asia Pacific, Europe, History, Public Space, Transportation and tagged Informal Space, Le Corbusier, New Territories, Plan Voisin, Streetlife, Transit-Oriented Development, Tseung Kwan O, Urban Design, Ville Radieuse . Bookmark the permalink . Post a comment below or leave a trackback: Trackback URL. Le Corbusier was definitely the bane of human-scale, organic (and just plain enjoyable)urban development. That’s what happens when urban-planners over think. Actually, I’d argue that the less planning, the better the end result. Good urban design isn’t planned, it emerges from need and use.